Living in the melting pot known as New York, it is no surprise to see many things considered out of the norm of society. 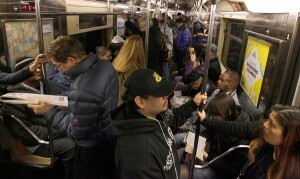 One of the best places to see these types of people is on the subway. The subway system is like the “great equalizer.” Everyone takes the subway regardless of status, income, or family background. It is the only place where you can find a business man writing out important documents sitting next to an old Chinese man in a sweats and sneakers. I sat on the train, traveling home late at night after an event with my family and the array of strangers to view followed with more intrigue that it would in the daytime. My parents had found a spot to squeeze into and I stood, holding onto a pole wondering when my feet would fall off. That is when I noticed who my parents sat next to: an amazing mohawk. I noticed the hair before I noticed there was even a human being attached. Also called the Liberty Spikes, his hair stood straight in around 20 partitioned hair groups and created a perpendicular halo. It was amazing. How can hair do that? 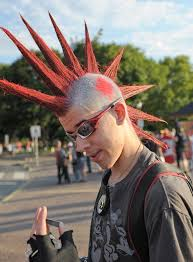 This was my first experience with seeing a well done mohawk in person that occurred around the age of 12-14. I have seen plenty of bad ones, but never artistically perfected hair spikes standing from the base of the man’s head and reaching for the sky. They stood for the freedom that they took their name from, defying gravity and proclaiming individuality. I wish I could have complemented the man. However, my parents were there and this was the classic example of a “young person you should not talk to”. 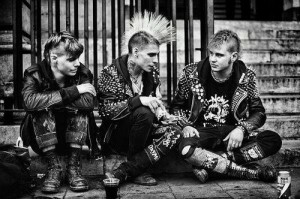 “Alternative”, the way this man was dressed, does not equal delinquent or drug abuser. To me, he was simply a person with really cool hair. To them he was already categorized into a dead-zone which they refused to associate into. The man left for his stop on the subway and my mental compliments faded with their conversations in my head.